Each season, we look forward to a new slew of fresh swimwear trends, and this summer, retro swimsuits are too prevalent of a style to ignore. If they say three's a trend, then retro swimsuits are in a category of their own. What we love about the rise of this bathing suit aesthetic is that although obviously touching on details of the past, the 2018 version still manages to feel so right now. 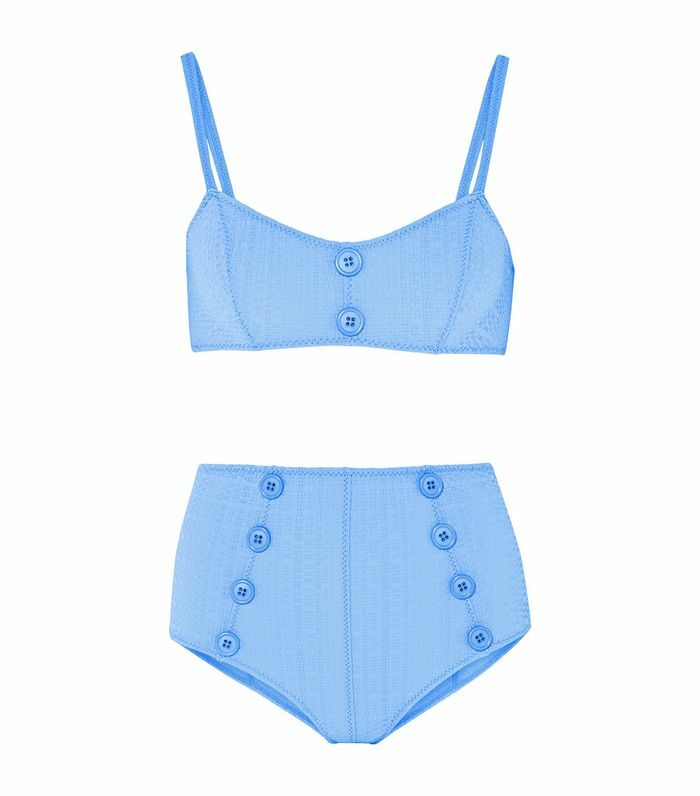 Ahead we've rounded up the retro swimsuits we are madly in love with. Some of our favorite details include white trim, buttons, peplums, high-rise bottoms, and more. If you're looking to invest in a bikini or one-piece this summer that not everyone and their mothers will have, retro swimwear is your best bet. Button up, summer is almost here. Those flowers are almost too pretty to wear in the water. There's just something about low-back one-pieces. Cute doesn't even begin to cut it. The retro rings make this black suit feel special. It's not every day you see a swimsuit with a collar. This summer, modest is the hottest, and you can quote us on that. Polka dots were basically made to grace the presence of adorable swimwear. Everything about this screams "take me to the beach immediately." Meet the swimsuit brand we've been crushing on this season. This is giving us major sailor vibes, in a good way. Give us white trim and drawstrings, or give us death. Okay, we basically just want what this girl's having. Serving ballet pink gingham realness. A white suit with a lot of personality. One of our favorite brands now does swimwear, and we could not be more excited. Retro swimwear in its simplest form. Too much ruffle? Or not enough? A subtle striped suit you'll wear all summer long. This ruching is taking us back to the '50s. A retro suit that still feels modern. Yes, it's possible. In case this swimsuit style isn't for you, we've rounded up 18 of the best swimsuits under $100 for you to shop as well. You're welcome.